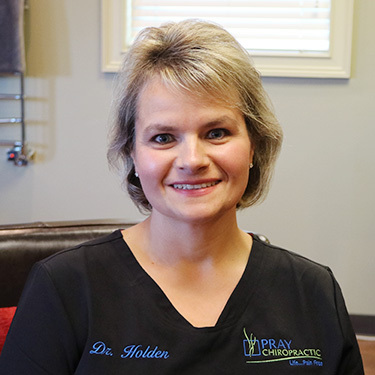 Before attending Chiropractic college, Dr. Holden earned her Bachelor of Science in biology from North Georgia State University in Dahlonega, GA. Dr. Holden then obtained her Doctor of Chiropractic from Sherman College of Chiropractic in Spartanburg, South Carolina. She graduated as valedictorian and gave the commencement speech. Just as she worked hard to be her best, she gives her best to patients so they can be their best. Before coming to Pray Chiropractic‘s Dalton office, Dr. Rebecca practiced in Chattanooga, Tennessee for 12 years and believes that there is no age limit to chiropractic. She has seen many success stories including patients who had come into the practice with walkers barely able to walk to going out walking without assistance. She finds it gratifying to help patients to get their lives back. When she’s not working, Dr. Holden enjoys spending time with her family, including her husband, Wayne and their three daughters. She’s also fostered more than 40 children in her home over a 12-year period. In her spare time, she enjoys gardening, volunteering and playing the piano at church. Contact Pray Chiropractic today to book an appointment with Dr. Rebecca!